Rostov kremlin. Church of the Hodegetria Icon, south view. July 12, 2012. The Church of the Hodegetria Icon demonstrated the exuberance of early Russian architects. At the beginning of the 20th century the Russian chemist and photographer Sergei Prokudin-Gorsky invented a complex process for vivid, detailed color photography (see box text below). Inspired to use this new method to record the diversity of the Russian Empire, he photographed numerous architectural monuments during the decade before the abdication of Tsar Nicholas II in 1917. Certainly among the most colorful structures Prokudin-Gorsky photographed is the Church of the Hodegetria Icon in Rostov Veliky, which he visited in 1911. My own photographs of this church were taken during several visits between 1987 and 2012. Located some 130 miles northeast of Moscow, Rostov Veliky (the Great) is one of the earliest historically attested towns in Russia, first mentioned under 862 in the chronicle "Tale of Bygone Years." Its main architectural ensemble is the majestic kremlin, which rises above the north shore of Lake Nero. The kremlin’s original designation was the Court of the Metropolitan, in recognition of its primary builder, Metropolitan Jonah of Rostov. After the Patriarch, Metropolitan is the highest ecclesiastical rank in the Russian Orthodox Church. Jonah Sysoevich (ca. 1607-90) was the son of a country priest named Sysoi. Tonsured at the Resurrection Monastery in Uglich, he rose through the monastic hierarchy, and in 1652 was appointed Metropolitan of Rostov by the newly elected Patriarch Nikon in Moscow. Jonah had at his command villages with some 16,000 peasants, as well as the best craftsmen and artists of a large, prosperous diocese. Within 20 years — between 1670 and 1690 — Jonah's builders erected not only several large churches and residences for the Metropolitan's Court, but also the kremlin’s magnificent walls and towers. After Jonah’s death in 1690, his work at the kremlin was continued by the Metropolitan Josephat, whose buildings included a church dedicated to the Hodegetria Icon of the Mother of God. The Hodegetria Icon, which depicts Mary holding the Christ Child on her left arm and pointing to the infant with her right hand, is one of the most venerated objects in Russian Orthodoxy. A particularly notable example was held in the Dormition Cathedral in Smolensk. Completed in 1693 at the northwest corner of the kremlin walls, the Rostov Church of the Hodegetria Icon underwent modifications in the 18th century. However, its basic form, featuring a single cupola and an open gallery on the upper floor, remained. 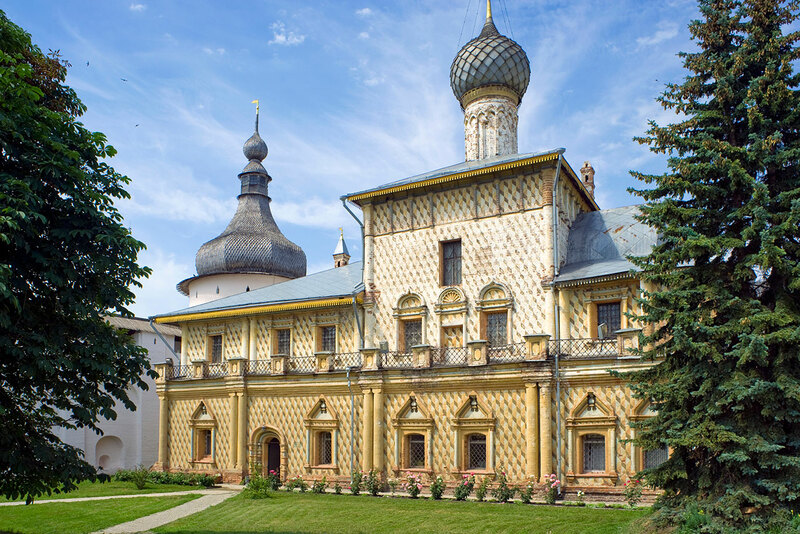 The exuberantly painted diamond pattern on its exterior was apparently instigated by Afanasy Volkhovsky, bishop of Rostov from 1763-1776, who was known to be fond of “Moscow Baroque” ornamentalism. The diamond pattern was originally imported to Muscovy by Italian architects at the turn of the 16th century. The earliest example is the “Faceted” or “Rusticated Palace,” completed with diamond rustication in the Moscow Kremlin in the 1490s. Although the diamond pattern had an enduring appeal in Russia, local builders rarely applied it in carved stone. It proved much easier to paint the facets on brick walls as a colorful trompe l'oeil. The surge of ornamentalism at the end of the 17th century saw a revival of this technique throughout Muscovy, from Kostroma to Sergiev Posad. The Rostov church is a late example. With the death of Josephat in 1701, little else of note was built in the Rostov kremlin. Skilled masons throughout Russia were drafted into the construction of St. Petersburg, founded in 1703. With the transfer of the regional metropolitanate from Rostov to Yaroslavl in 1787, the Rostov kremlin began to decay. Fortunately, in the late 19th century Rostov merchants gathered funds to maintain the kremlin ensemble. In 1883, the White Chamber, built as a banquet hall for the Metropolitan of Rostov, opened as a museum of church antiquities that was the predecessor of the current distinguished Rostov Kremlin Museum. Thus, through local pride, Metropolitan Jonah’s visionary project was preserved for Prokudin-Gorsky and subsequent generations. A comparison of my photographs of the Hodegetria Church with those of Prokudin-Gorsky shows few changes over the decades. A notable difference just beneath the roof is the disappearance of a row of iconic wall paintings, with a large image of the Virgin of the Sign (Znamenie) in the middle. It is not clear when they were originally created, but such exterior paintings were usually effaced during the Soviet period. In the early 20th century the Russian photographer Sergei Prokudin-Gorsky invented a complex process for color photography. Between 1903 and 1916 he traveled through the Russian Empire and took over 2,000 photographs with the new process, which involved three exposures on a glass plate. In August 1918 he left Russia with a large part of his collection of glass negatives and ultimately resettled in France. After his death in Paris in 1944, his heirs sold his collection to the Library of Congress. In the early 21st century the Library digitized the Prokudin-Gorsky Collection and made it freely available to the global public. A number of Russian websites now have versions of the collection.In 1986 the architectural historian and photographer William Brumfield organized the first exhibit of Prokudin-Gorsky photographs at the Library of Congress. Over a period of work in Russia beginning in 1970, Brumfield has photographed most of the sites visited by Prokudin-Gorsky. This series of articles will juxtapose Prokudin-Gorsky’s views of architectural monuments with photographs taken by Brumfield decades later.